We spent the run-up to Superbowl XLVIII with Nike, at an activation just a few miles from MetLife Stadium. 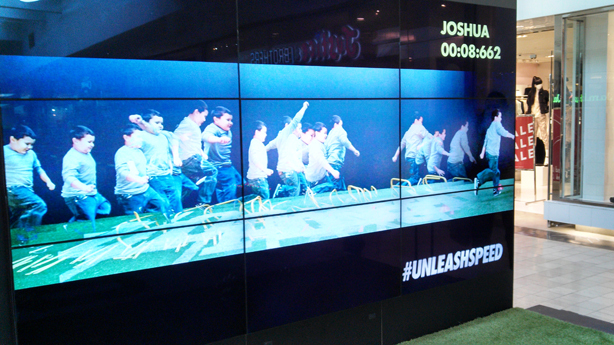 We were tasked with collaging an obstacle course of football drills as part of their #Unleash Speed campaign. Participants ran through an obstacle course set up over a 30 yard astro-turf track. Cameras and lights were set up along the track, capturing the athletes in action. MVS Studio took the captured images, collaged them into a single image that encapsulated the entire run, and displayed each glorious moment. Our process was automated, so it made for a quick turn around. The collaged images were instantly displayed on a grid of plasmas at the end of the track and we made available for sharing on social networks. MVS was at the center of the action, collaborating with several different companies to bring this expereince together. It got our studio buzzing the week before the big game; stirring up our passions for art, sports and interactive experiences!